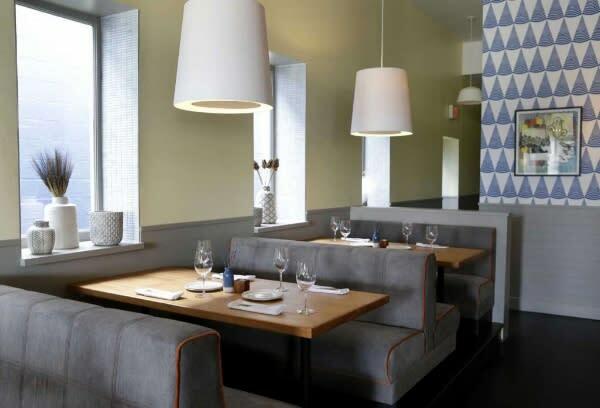 No restaurant embodies the cool, laid-back aura of The Heights more than Alice Blue. This modern American Bistro is open seven days a week but it is their weekend brunch menu that keeps hungry Houstonians coming back for more. Upon entering the quaint restaurant, guests are greeted by a ray of light and an open and relaxed feeling. Oversized booths in cool greys and blues line both sides of the restaurant with walls adorned with a geometric wallpaper that adds pops of yellow. A panel of thin pieces of wood section off a full bar and cozy lounge section perfect for catching up with friends while sipping on specialty cocktails. When it comes to the brunch menu, Alice Blue offers a variety of classic favorites with the flavor dial turned up a notch. Take for instance the quiche, considered as one of the best in the city, packed full of bacon and spinach and served as a Hulk-sized piece of pie. Or choose the brioche French toast smothered in seasonal fruit, jam, and maple syrup. I would suggest beginning with one of their fresh-baked pastries like a cinnamon croissant roll or the crumbly cherry scone served with tart lemon curd. And it wouldn’t be brunch without a cocktail to wash it down. Alice Blue offers a plethora of options for those looking to day drink. Besides the usual brunch cocktail staples like mimosas and bloody marys, guests can order creative cocktails like a Kentucky mule, paloma or an old-fashioned. After enjoying a delicious brunch at Alice Blue, take a stroll through The Heights and experience all this historic neighborhood has to offer. You can search for hidden treasures at local thrift boutiques like Bliss on 19th, soak in art at Jumper Maybach’s gallery, or just enjoy the day and a latte on the patio of Boomtown Coffee. The possibilities for the perfect weekend are endless in The Heights but they should always begin with a decadent brunch at Alice Blue. Alice Blue is open for brunch on Saturday and Sunday from 10 a.m. to 3 p.m.